Amazon Simple Storage Service (S3) is the largest and most performant object storage service for structured and unstructured data and the storage service of choice to build a data lake. With Amazon S3, you can cost-effectively build and scale a data lake of any size in a secure environment where data is protected by 99.999999999% (11 9s) of durability. With a data lake built on Amazon S3, you can use native AWS services to run big data analytics, artificial intelligence (AI), machine learning (ML), high-performance computing (HPC) and media data processing applications to gain insights from your unstructured data sets. Using Amazon FSx for Lustre, you can launch file systems for HPC and ML applications, and process large media workloads directly from your data lake. You also have the flexibility to use your preferred analytics, AI, ML, and HPC applications from the Amazon Partner Network (APN). Because Amazon S3 supports a wide range of features, IT managers, storage administrators, and data scientists are empowered to enforce access policies, manage objects at scale and audit activities across their S3 data lakes. Amazon S3 hosts more than 10,000 data lakes for household brands such as Netflix, Airbnb, Sysco, Expedia, GE, and FINRA, who are using them to securely scale with their needs and to discover business insights every minute. Why build a data lake on Amazon S3? Amazon S3 is designed for 99.999999999% (11 9s) of data durability. With that level of durability, you can expect that if you store 10,000,000 objects in Amazon S3, you should only expect to lose a single object every 10,000 years! The service automatically creates and stores copies of all uploaded S3 objects across multiple systems. This means your data is available when needed and protected against failures, errors, and threats. Automatically store copies of data across a minimum of three Availability Zones (AZs). To provide fault tolerance, Availability Zones are separated by several miles—but no more than a hundred to ensure low latencies. Bring preferred analytics platforms to your S3 data lake from the APN. Comprehensive flexibility to operate at an object level while managing at scale, configure access, enable cost efficiencies, and audit data across an S3 data lake. S3 data lake customers have access to numerous AWS analytics applications, AI/ML services and high-performance file systems. This means you can run numerous workloads across your data lake, without additional data processing or transfers to other stores. You can also bring your preferred third-party analytics and machine learning tools to your S3 data lake. 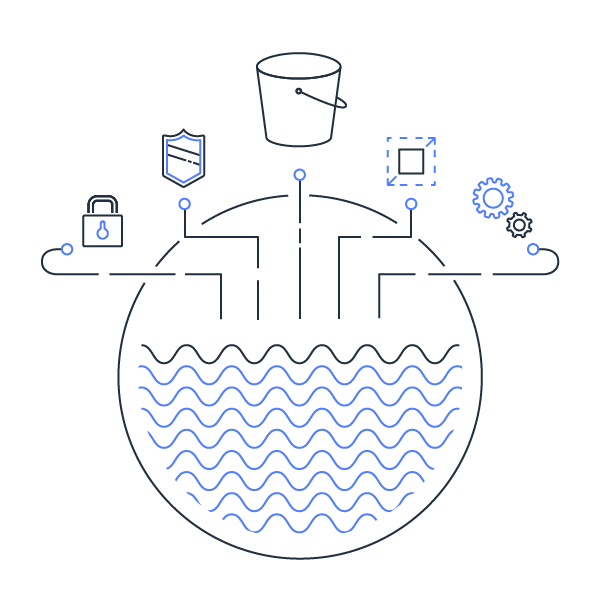 AWS Lake Formation lets you create a secure data lake in days instead of months and is as simple as definining where data resides and what data access and security policies to apply. Lake Formation then collects data from different sources and moves it into a new data lake in Amazon S3. The service cleans, catalogs, and classifies data using machine learning algorithms and eanbles you to define access control policies. Users can then access a centralized catalog of data which lists available data sets and their usage terms. Once data resides in an S3 data lake, you can use any of the following purpose-built analytics services for a range of use cases, from analyzing petabyte-scale data sets to querying the metadata of a single object. With an S3 data lake these can be done withou resource- and time-intensive extract, transform, and load (ETL) jobs. You can also bring your preferred analytics platforms to your S3 data lake. Quickly query datasets in your S3 data lake with simple SQL expressions and get results in seconds. Athena is ideal for ad-hoc querying and doesn’t require cluster management, but it can also handle complex analyses, such as large joins, window functions, and arrays. Analyze S3 data with your choice of open source distributed frameworks, like Spark and Hadoop. Spin up and scale an EMR cluster in minutes—without node provisioning, cluster setup and tuning, and Hadoop setup—and run multiple clusters in parallel over the same data set. Simplify ETL jobs across your S3 data lake to make your data searchable and queryable. With a few clicks in the AWS console, register your data sources and then AWS Glue will crawl them to construct a data catalog using metadata (for table definitions and schemas). Run fast, complex queries using SQL expressions across exabytes of S3 data without moving to Redshift. You can run multiple clusters in parallel across the same data sets. Existing Redshift customers can use this feature to extend analytics to their unstructured data in Amazon S3. You can quickly launch AWS AI services such as Amazon Comprehend, Amazon Forecast, Amazon Personalize, and Amazon Rekognition to discover insights from your unstructured datasets, get accurate forecasts, create recommendation machines, and analyze images and videos stored in S3. You can also deploy Amazon Sagemaker to build, train, and deploy ML models quickly with your datasets stored in S3. S3 Select enables applications to offload the heavy lifting of filtering and accessing data inside objects to S3. With S3 Select, you can query object metadata without moving the object to another data store. By reducing the volume of data that has to be loaded and processed by your applications, S3 Select can improve the performance of most applications that frequently access data from S3 by up to 400% and reduce querying costs as much as 80%. You can use S3 Select with Spark, Hive and Presto in Amazon EMR, Amazon Athena, Amazon Redshift, as well as APN partners. Amazon FSx for Lustre provides a high-performance file system that works natively with your S3 data lake and is optimized for fast processing of workloads such as machine learning, high performance computing (HPC), video processing, financial modeling, and electronic design automation (EDA). In minutes you can launch a file system that provides sub-millisecond access latency to your S3 data and allows you to read and write data at speeds of up to hundreds of gigabytes per second (GBps) of throughput and millions of IO per second (IOPS). When linked to an S3 bucket, an FSx for Lustre file system transparently presents S3 objects as files and allows you to write results back to S3. With a wide range of features, Amazon S3 is the ideal service to build (or re-platform) and manage a data lake of any size and purpose. It is the only cloud storage service that lets you: manage data at the object, bucket, and account levels; make changes across tens to billions of objects with a few clicks; configure granular data access policies; save costs by storing objects across numerous storage classes; and audit all activities across your S3 resources. Amazon S3 lets you manage data with object-level granularity, as well as at the bucket and account levels. You can append metadata tags to an object and use them to organize data in ways that work for your business. You can also organize objects by prefixes and buckets. With these capabilities, quickly point to one or a group of objects to replicate across regions, restrict access, transfer to cheaper storage classes, among other tasks. With S3 Batch Operations, you can take action across billions of objects with a single API request or a few clicks in the S3 Management Console, and audit the progress of your requests. Modify object properties and metadata, copy objects between buckets, replace tag sets, configure access controls, restore archives from S3 Glacier, and invoke AWS Lambda functions – in minutes instead of months. Use bucket policies, object tags, and access control lists (ACLs) to restrict access to specific buckets and objects. You can also use AWS Identity and Access Management to define user access within an AWS account. Organizations that need to block all access requests to their data can configure S3 Block Public Access to enforce a “no public access” policy for a specific bucket of objects or an entire AWS account. All S3 customers can store data across 6 distinct storage classes that are designed to accommodate different access requirements at corresponding costs. Use S3 Storage Class Analysis to learn the access patterns to your data. Then, configure lifecycle policies to transfer less frequently accessed objects to cheaper classes or archive them in S3 Glacier or S3 Glacier Deep Archive for maximum savings. With S3 reporting tools, quickly discover who is requesting access to what data and from where, audit object metadata (such as storage class, retention date, business unit, and encryption status), monitor usage and costs, learn access patterns, among other activities related to your S3 resources. With these insights, make changes to optimize your data lake and the applications that rely on it, and reduce costs.